Before moving on to Dare #3, God spoke to me on another aspect related to how love is kind (Dare #2). Not only do I need to show thoughtful actions towards my husband, I need to be mindful of how I speak about him to others. If I’m doing the Love Dare Challenge to become more and more like Christ, than I need to love and care for my husband as Christ loves me. 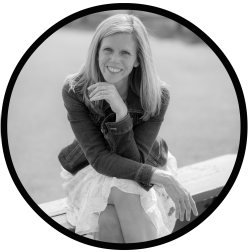 If I’m tearing down my husband with my words, Christ is not reflected in me. When Paul describes what we are to cloth ourselves with, we see how God’s kind of love is "directed outward towards others, not inward toward ourselves. God’s kind of love is utterly unselfish" (1 Corinthians 13:4-7, Life Application Study Bible). In Dare #3 the writers of The Love Dare wrote, “Almost every sinful action can be traced back to a selfish motive.” It’s not surprising they address how love is not selfish early on in the book then. The Excellent or Praiseworthy: 40 Days of the Deployment Dare suggests reading this chapter more than once. They say it’s that important. On page 11 of the book there is a convicting bottom-line statement: "you either make decisions out of love for others, or love for yourself." Since love is not self-seeking (1 Corinthians 13:5) I'd say it’s time to rid myself of selfishness. 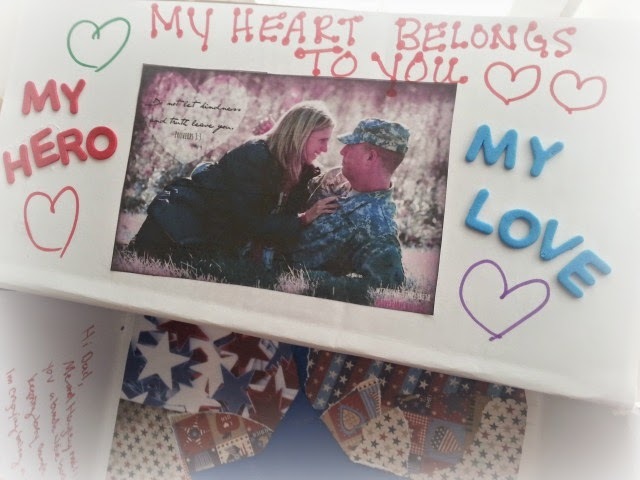 To let my husband know I am thinking of him I send him care packages! 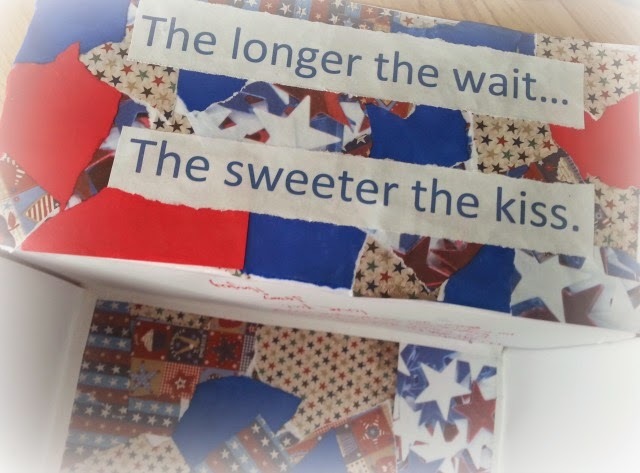 I have not been overly creative with what has gone in the previous care packages so I wanted to make this one extra special. 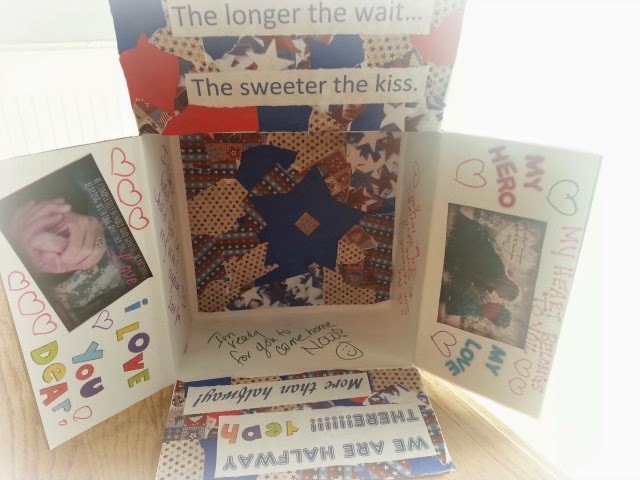 His unit has received plenty of care package love so the needs are limited. I’m grateful for the love they have received but challenged over what to send. My husband did make a recent request for a box of screws. What a strange and not exciting request. Imagine my delight when I came across his favorite chips while walking up and down the aisles of Target. I seriously did the happy dance because these chips are hard to find. I threw six of them in my cart, in addition to a bag of pistachios (another favorite of his), with a big smile on my face. On Saturday morning, before tackling anything of my own personal liking (such as a mani/pedi) I ventured off to Home Depot for screws, because that is what love does, and then to the post office. After sending off the care package I spent more time on how love is not selfish because I agree it’s that important. I went back to the corresponding notes for 1 Corinthians 13:4-7 in the Life Application Study Bible: “Thus the more we become like Christ, the more we will show love to others." For Philippians 2:3 it states, "Considering others’ interests as more important than our own links us with Christ, who was a true example of humility." I'm seeing a clear picture of how God does not want us to cloth ourselves with selfishness. He's pretty strong on the point. We are to love and honor others above ourselves (Romans 12:10). My desire is for my husband to see Christ in me. Instead of him potentially thinking he has a selfish wife, I’d rather him describe me like the writers describe an unselfish person: "willing to set aside their own jealousy and demands to lose themselves in the joy of loving, serving and giving to another." I’m grateful for the example Christ has given me of how to show real love to my husband. And I’m grateful for the grace of the Holy Spirit when I fall short. What love discoveries did I make this past week? God emphasizes loving others as very important; naming it as the Second Commandment of the Ten He gives to us. While our motivation for loving others should not be about what we gain, we are immensely blessed when we choose to love. In the past three weeks, the phone and Facetime conversations I've shared with my husband have beautifully reflected the results of choosing love. Let's just say, I've been wearing one-mighty-big-smile. 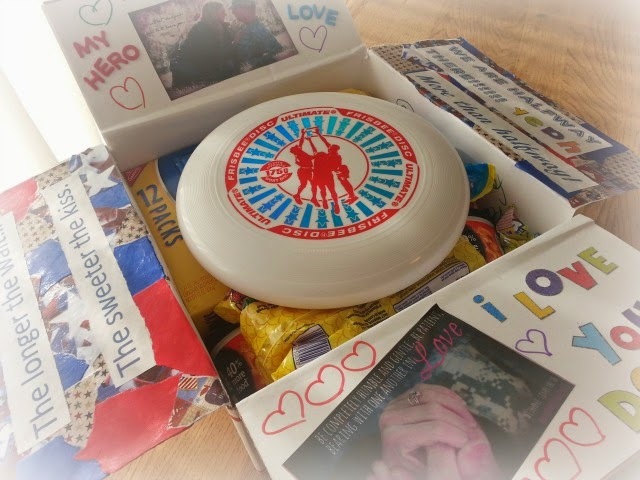 Before moving on to Dare #4, I decided my husband needed another care package filled with love. Oh, what fun I had with this one. That is a pretty impressive care package! Your words spoke beautifully to the kind of love Christ has for us, and how we can emulate that love. Thank you, Lori. I hope he enjoys it as not sure I will go that crazy again. LOL. It was fun to pull together though. Thank you for stopping by and for your kind words. Blessings. LOVE LOVE LOVE your care package. I just pulled together one for my neice who's with the Peace Corp in Macedonia. It's amazing how much love some Lucky Charms, Rice-a-Roni, marshmallows, and taco mix can speak! The pictures with your man are so inspiringly beautiful, my friend. Thank you for sharing such intimate snapshots with us. Thankfully to send to an APO it only costs $15. But I'd probably still send even if it cost $38. Sending some love is great fun. Thank you for all your encouragment, Linda. I appreciate you. I look forward to chatting soon. Thank you, Ashley. I love seeing you here. You are so sweet. Love you. I'm glad you are enjoying the series, Sharita. You are totally adorable, friend. Your CD sounds AWESOME. Thank you for always making me smile. Love you. 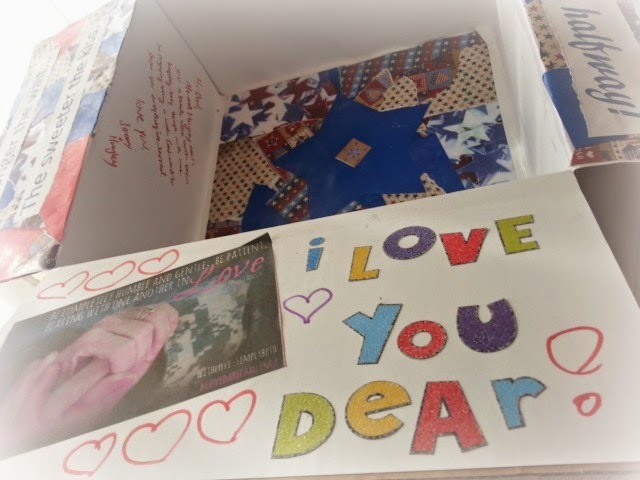 Beth, I got a little giddy just seeing the photos of this care package!! How FUN! His heart will be so bursting when he gets this. Hi there, Beth. I enjoyed your posting on this. 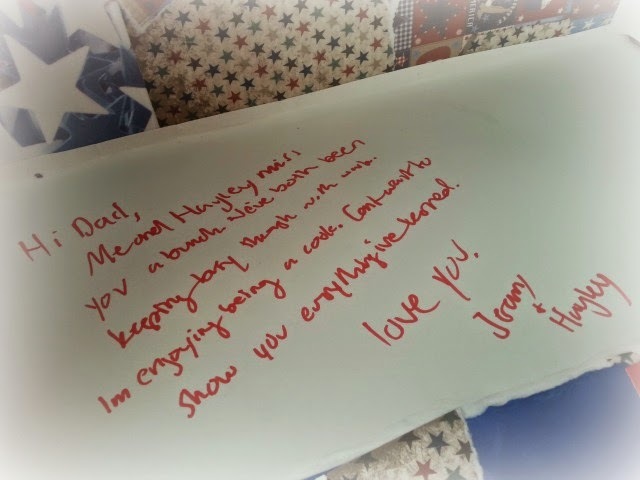 I bet your husband was surprised with the box, the practicality of the screws, but most importantly the richness of your heart. Thanks for YOUR service. Thank you so much, Chris. It's always a delight to see you here. Blessings to you. What love and care you poured into this. And also in challenging us to dare to love fully. You are the encourager. Thank you. Thanks you, Lisa. I am really enjoying this challenge. Happy Mother's Day to you. Wow, pretty amazing stuff. Thanks for showing us this and reminding us how to love others well. Thank you for stopping by, Julie. He's gonna love these boxes! Thanks for the reminder that loving well is about the other person, not so much about me and how I'd like to love them. Hope you have a blessed Mother's Day weekend. I'll be thinking of you! Much love. Wishing you a blessed Mother's Day as well. Grateful for your friendship. Love you. What a great care/love package! I'm sure your husband truly appreciates all the kindness that went into putting it together! What a great way to say, "I love you"! 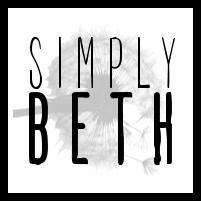 Wow, Beth! What an amazing week you've had! That care package is awesome! Great job! I'm so thankful that you're experiencing the results of choosing love. Remember, keep those memories close to your heart. You will need them during the times when satan tries to convince you of his lies. You are on a beautiful and blessed journey, my friend! Praying for you! You have such a sweet, lovely heart. I always feel blessed when I stop by your place and read your posts! This reminds me of when my husband and I made a silent pact (neither of us verbally discussed this, we simply practiced it) early in our dating relationship not to talk ill about each other in front of people. But I need to do more! I need to encourage him and build him up, thanking him for all he does for his family. Thank you for this critical reminder! Blessings! Thank you for your kind words, Carrie. I'm so delighted to hear you feel blessed when you come here. I feel the same about your place too. 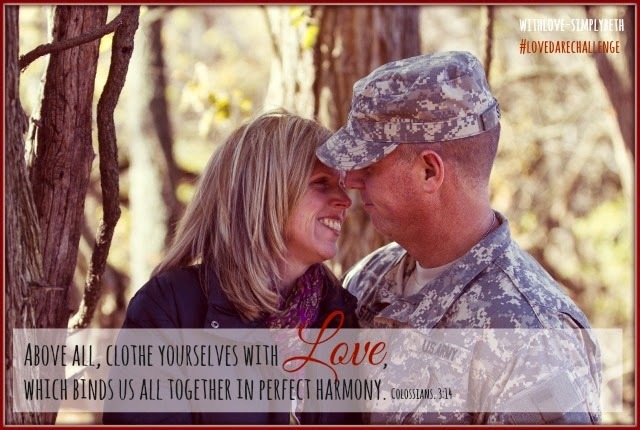 Thank you for sharing about you and your husband too. I love that. I'm thankful for God's example of how to love our spouses and for his grace when we fall short. Blessings to you. WOW, Beth, what a care package! Fun to do and as you said above, maybe just this time! But it is worth it! Good words about the way we speak about our husbands to others. When we are honoring to Jesus we will honor and respect the beautiful man God has blessed us with. Over halfway! I pray for him and all of those in harm's way over there and everywhere. It's always wonderful to see you here, Linda. Thank you so much for stoping by and for your encouragement. 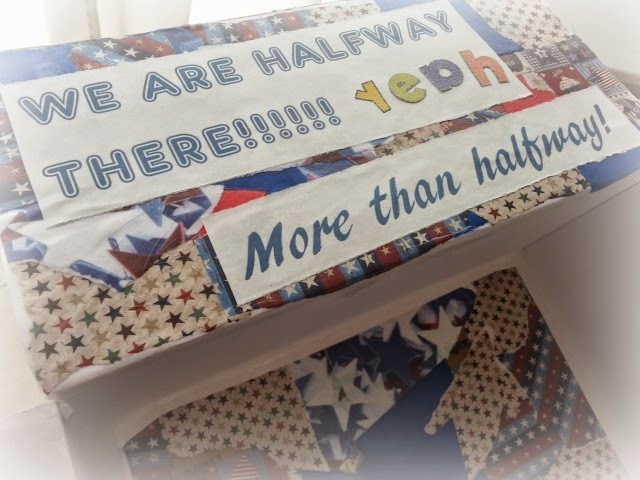 Yes...I'm super excited about being over halfway there until he returns home. I'm ready to hug him. Much love to you. Thank you for linking this post up at Beauty Observed. It truly is a thing of beauty! Oh, thank you, Elizabeth. It was so much fun to make. Not sure I can pull that off every time but I know it will be a sweet surprise for him. Thanks for hosting us every Friday. I just adore coming over to your place. Much love. You inspire and challenge me to love my husband well. Thank you, sweet friend. Love you. What a special surprise it was to see you here, Molly. Thank you so much. I'm sorry to hear your hubby is on his way out again. Please don't hesitate to reach out if you ever want to chat. I'm grateful for your friendship. Blessings.